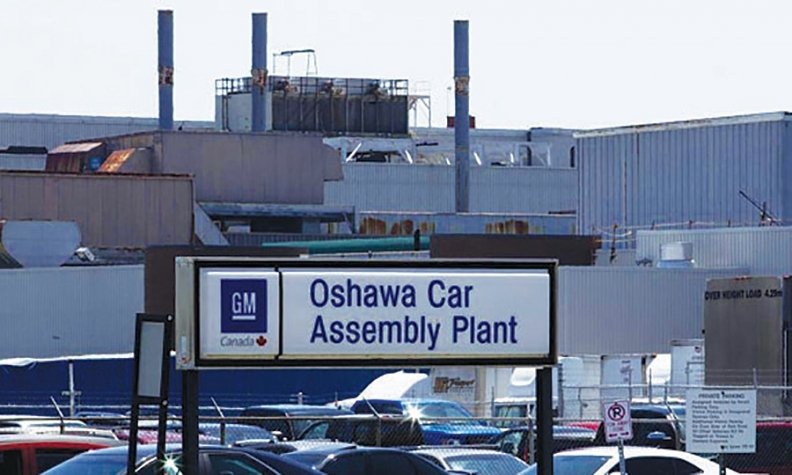 The Oshawa Assembly plant will also be idled during the same period, confirmed GM spokesman Mathew Palmer April 13. General Motors factories in Canada won’t be affected by the North American shutdowns the automaker announced April 12 in New York. Alan Batey, GM’s president of North America, told reporters at the New York International Auto Show that the company would idle multiple plants for a total of 10 weeks later this year. The shutdowns will not affect plans already set for three GM plants in Ontario. The automaker previously announced CAMI’s two-week summer shutdown in Ingersoll has been pushed back to July 16 and will last through July 29 instead of it the usual first two weeks of July. “We do not expect any additional downtime at CAMI and as previously announced, work is well under way and on schedule at Oshawa Assembly on investments taking place in the plant” to support new model and product changes,” Palmer wrote in an email to Automotive News Canada. The Oshawa plant currently has two production lines and builds the Chevrolet Impala, Buick Regal, Cadillac XTS and Chevrolet Equinox. Production of the Regal and Equinox are set to end there this year. During contract negotiations with the union Unifor in September 2016, GM agreed to spend $413.9 million on its Ontario facilities. Most of that will be used to retool the Oshawa plant. Neither the automaker or union has said which vehicle will be added to Oshawa. Reuters, citing sources familiar with Canadian labour negotiations at the time, reported Oshawa will install component parts and do final assembly of pickups using bodies shipped from a GM plant in Fort Wayne, Ind. GM is currently retooling plants across North America for upcoming models, including redesigned pickups. “Our [U.S.] inventory is high because we’re going to take 10 weeks out in the back end of the year as we’re modifying our plants, particularly with pickup trucks,” Batey said. U.S. supplies of the Chevrolet Silverado jumped in February to 115 days-worth from 78. Automakers don’t report supply numbers in Canada. Batey declined to say when GM plans to introduce a redesigned Silverado and GMC Sierra. Analysts and dealers have told Automotive News that they expect GM to begin selling its next-generation full-size pickups in the second half of 2018. The current generation of the Silverado and Sierra went on sale in 2013, and GM freshened them in 2015.